We read this book and learned alot about penguins. Here is some of the penguin art the children made. The penguin is a flightless bird. There are many different types of penguins. We learned all about Emperor penguins. We found penguins to be very interesting birds. 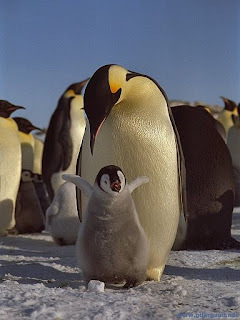 The Emperor is the largest of the 17 penguin species. Emperors are the deepest divers of any bird. They are also very strong birds. The mummy lays her egg in mid-May, then leaves to spend the winter at sea. The daddy spends the next 65 days looking after the egg which he rests on his feet. In mid-July, when the mummy returns, she finds the daddy by having memorised his call. The daddy penguin carefully gives the egg to the mummy. The egg hatches soon after.